Skarpnäck Plaza, Stockholm. Park in Sweden by David Krug, Brotherhood and the city council of Stockholm. Welcome to Skarpnäck Plaza / Brotherhood Plaza, a cooperation between the city of Stockholm (Skarpnäck District), David Krug and Brotherhood. Together we have created a unique skate plaza and chill park. The concept that sets this plaza apart from other skate plazas is that it is not made of the common light grey skatepark concrete and plaza granite as a big grey uniform structure. Instead we use colorful sculptures and many styles of materials and obstacles, giving different areas of the plaza different architectural personalities. Many grass gaps and bushes adds to this unique plaza. 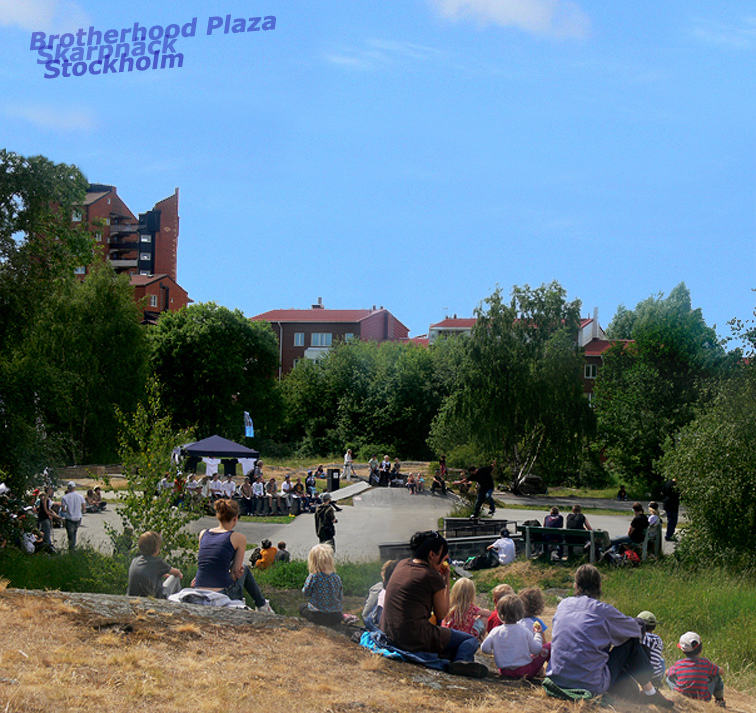 David on Brotherhood brought the initiative of this park to Stockholm City & Skarpnäck council during 2003-2008. Between 2006 and 2012 David and his crew built a big area with lots of creations. The idea is to get a street skate feeling by building things both for just hanging out and for skateboarding. Examples are colorful art sculptures for both skateboarding and for children climbing and playing, as well as barbacue places, planting fruit trees. Next to the street plaza a wide yellow spinebowl/ramp has been built. Through being the top voted place in Stockholm in a contest for lights, the park got 24 spotlights to keep the park lit in the evenings. Another purpose of the park is to inspire the creation of more colorful and green street skate parks in Swedem and some has emerged. Check below for more photos and videos from the park and some links to news articles about it. etc.